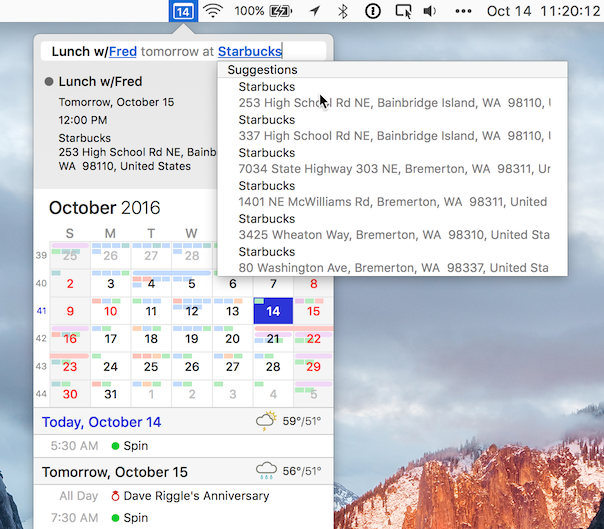 BusyCal Mac 3.1 has been released and is available for download. This update includes a new interactive Quick Entry Preview and bug fixes. The new Quick Entry Preview is displayed in the menu bar app as well as the main app. It displays a preview of the natural language parsing results while you type, so you can see how your input is being interpreted to ensure you get the desired results. It also displays interactive Attendee and Location pickers that allow you to click on a person's name to add them as an attendee, or click on a location to add its address. The update is free update for all BusyCal 3 customers and is available now. To update from within the app, select Check for Updates from the BusyCal menu. Or, Download BusyCal Mac and run the installer.